I recently had a conversation about works of art that stick with you. At different times in my life I have been absorbed by various sculptures, compositions or images. Once it was a stone lakshmi sculpture in a museum (I can’t remember which one) in Pasadena. I was strolling around looking at stuff in the museum, and had to stop and stare at it. I stood there for at least half an hour, sketching the ancient sculpture. Once I walked into the Museum of Art History in Vienna and was gobsmacked by Rubens’ ‘The Little Fur Coat’ hanging on the wall. Anyway right now it is this photograph. Together with the title, which I have used as the title of this post and which is also the headline of the article the photograph is originally from, it strikes me as no different in any important way from, say, Renaissance paintings along the lines of ‘Bacchus and Ariadne’ by Titian or maybe Jan Steen’s ‘Argument over a card game’. 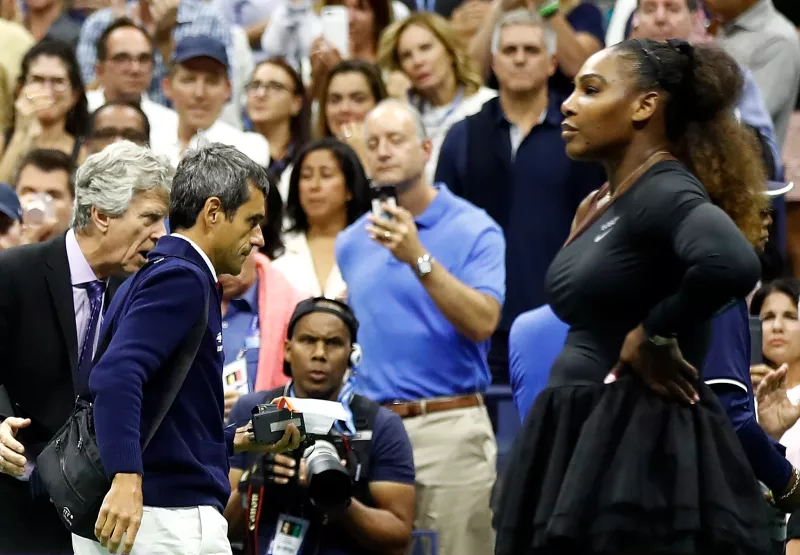 ‘Tennis umpires reportedly considering boycott of Serena Williams’ matches’ by Julian Finney (Getty Images) is currently hanging right at the front of my mental museum. I can’t look away. It’s perfect.